I feel sad today. A guy, a political leader to be a little bit more precise, has been assassinated in Darjeeling. In facts, violence has been raging in Darjeeling for 30 years. Tension is often tangible. And blood sometimes flows. To explain the problem to you in a few words and in a way that is much too brief, Darjeeling, where mainly Indians of Nepalese origin live, is located at the extreme north of the Indian State of West Bengal. In this particularly backed-off spot, roads are in a disastrous state, water is scarce, infrastructures are generally in an apalling state. Thus, many inhabitants of these mountains wish to create a new state called “Gorkhaland” within the Indian Union. And this, in order to stop keeping waiting for money that never comes from Kolkata and to enjoy an easier life like the Sikkim neighbour who depends directly from the Central State, namely Delhi. I hope that they will be able to solve these problems using reason rather than violence. Couldn’t the inhabitants of Darjeeling be given normal life conditions, suitable roads, running water and some autonomy so that they can decide what is best for themselves? Between political leaders who don’t do anything, those who are corrupted, those who make promises the day before elections and forget them the following day, those who divide instead of assembling and those who arouse masses, people would be in a grief to decide who to confine their destiny to. 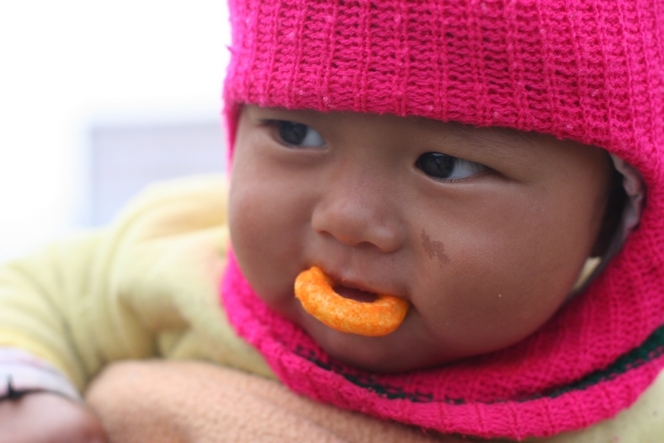 I choose this adorable toddler, coiled up in his mother’s arms with his life in front of him, to wish Darjeeling, its mountains I love so much and these Nepalese people who are dearest to me, a better future. The little Darjeeling train comes by… and it’s chaos ! 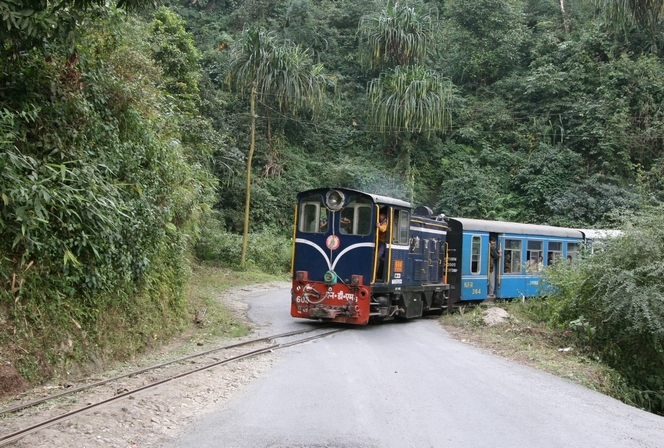 The little Darjeeling train is special because it likes to cross the road a number of times. It travels slowly, and so inevitably creates traffic jams, which the tourists love because it gives them time to take pictures. I like the fact that this little train of Darjeeling has the same familiarity with my blog as it has with the road, and crosses it from time to time, whenever it takes its fancy. It’s as if we must give way to it, and wait patiently while it passes. 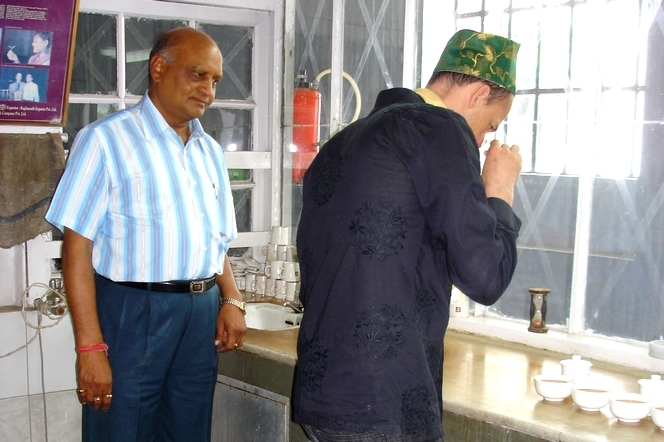 When you harvest the tea leaves, you must take great care to pick the right parts. Only the tea bud and the two adjacent leaves give you true quality. Sometimes, to prevent the tea pluckers from taking too much off, they are given a short piece of bamboo. This helps them pick just the right length of shoot and is a reminder of the standards of excellence required (like here at the Namring Tea Estate, Darjeeling, India). As I was mentioning it in a previous post, tea requires delicate care. Tea plants appreciate a bit of shade, especially if the sun is strong. 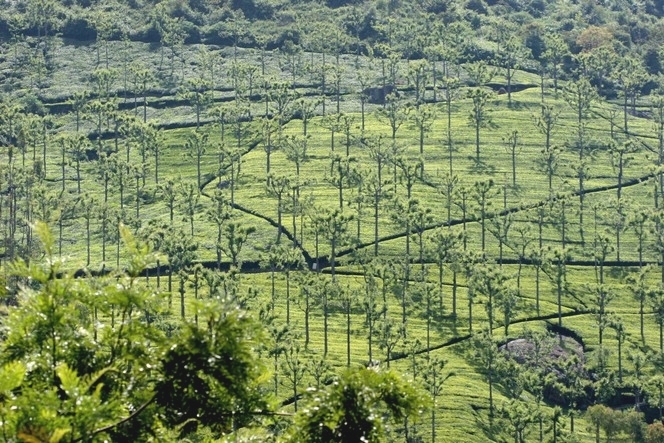 In the hottest regions, trees are planted to help the plants and give them some cover, like here in the Nilgiri mountains (India). So, not very good teas in this region, but beautiful landscapes, charming little villages (Coonoor, Munnar), gardens growing spices, hills covered with cardamom plantations… An appealing region to say it short. Tea is a serious matter, it requires much hard work and science to grow it, harvest its leaves, wither them, heat them, roll them, oxidise them, dry them, sort them and more. But tea is not just about that. It is also a simple drink, an everyday act, an affordable pleasure. 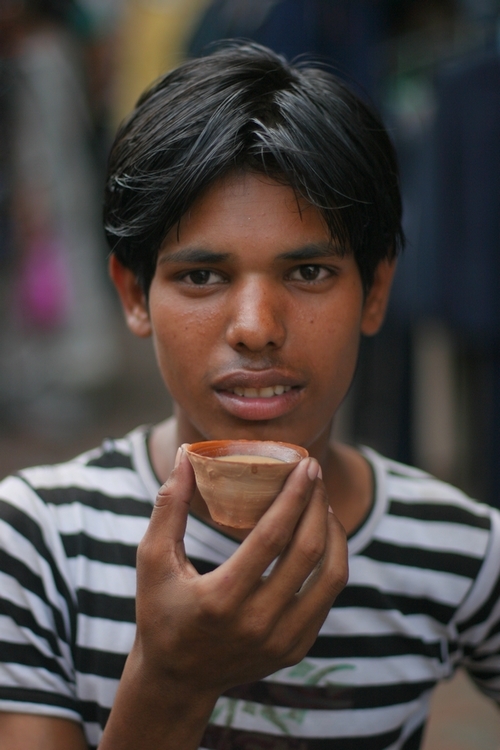 Here, in Kolkata, this street seller, just opposite the New Market, is enjoying his chai tea. He’s drinking it from a little throwaway earthenware cup. 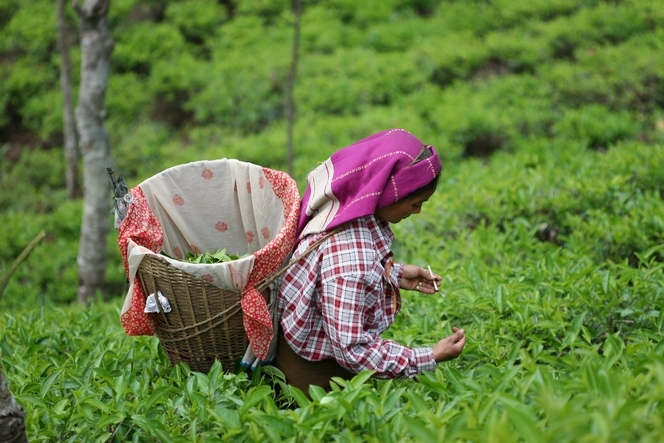 It was the British who introduced and organised tea growing in India. 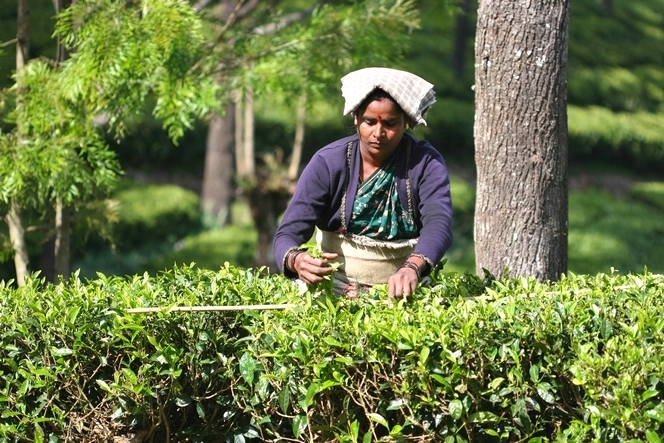 They created large tea plantations called tea estates. Keen to retain the comforts of home, they built charming, typically British cottage-style houses. 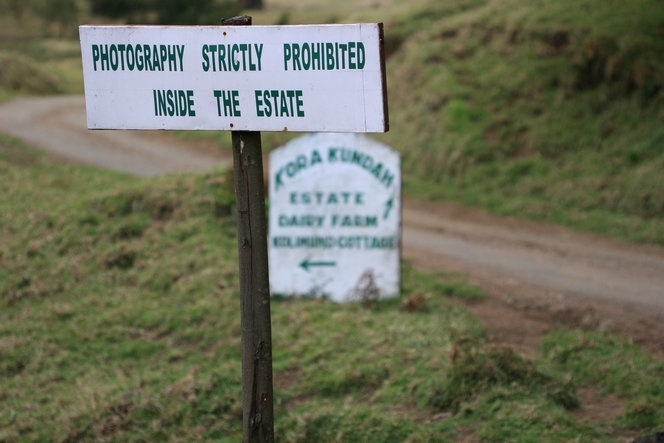 When I visited the Thiashola Tea Estate in India, I was lucky enough to be able to stay in this tea grower’s house. It dates back to the nineteenth century. 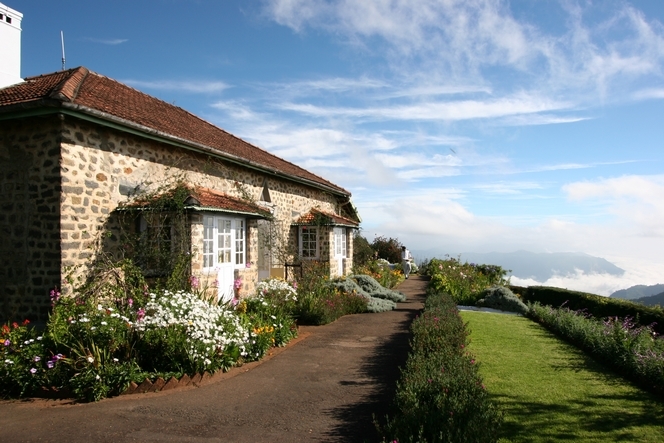 Nestled on the edge of the jungle, it overlooks the tea, the clouds and the Deccan plain. What a joy to arrive there, surrounded by flowers, to contemplate this unique landscape and enjoy its rare silence. A feeling of being at the edge of the world. Total isolation. The moment I loved best: at dawn, pulling on a sweater, going outside and sitting on the front steps, a bowl of steaming tea in my hands, admiring the glowing red sky as the sun rose. 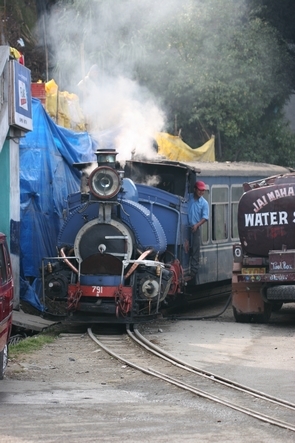 These days, when everything has to be fast, modernisation has also affected the little Darjeeling train. For one of the daily services, the steam train lets out a big sigh and takes a break to make way for a diesel engine, as we can see here. So this is a bit of progress to be avoided, unless the journey itself is not your aim and all that matters is to get there quickly.